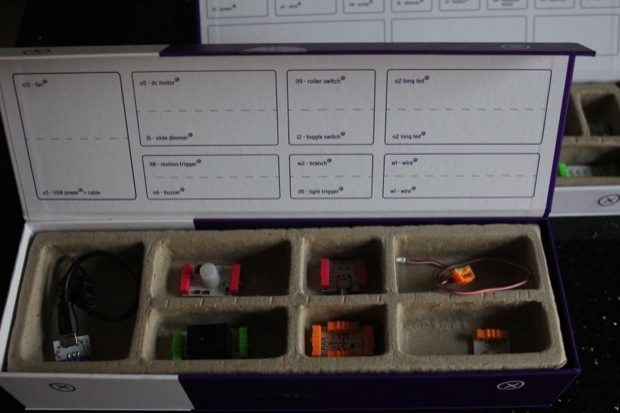 I’ve been hearing about LittleBits, an electronics kit for hobbyists and kids, for quite a while but I never got a chance to play with them until recently. The company recently announced a funding round with hardware manufacturer PCH and they launched their Extended Kit, a new box of bits. 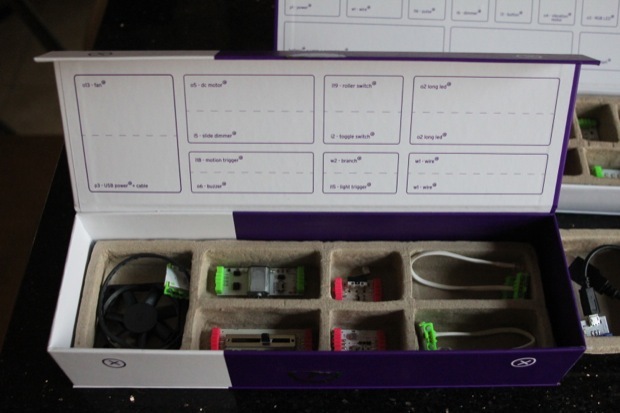 The kit allows you to build simple circuits using a power source, a connector, and an output. For example, you can connect an LED directly to the 9-volt power supply or you can add a potentiometer or switch to turn the LED on and off manually. There are other bits that allow you to pulse the output devices and add light and motion controls. Fans of old-timey electronics kits will find this whole setup quite familiar. The system is just complex enough to be interesting and simple enough for even young kids to use. My six-year-old son and I were able to build simple circuits and pretend, for example, we were making a trap for his sister’s dolls using a rolling switch and piezo buzzer. The pieces connect with small, foolproof magnetic brackets and stick together even during rough play. You can power projects via a 9-volt battery or with a USB cable (included in the Extended kit) and the pieces are mostly kid-safe especially considering that the wee ones will probably try to put their tongue on the LEDs when unsupervised. Now for the bad news. The Extended kit costs $149 and the basic kit – which I’d recommend – costs $89. It’s a bit pricey, and considering electronics kits like this one cost nearly the same, picking up the LittleBits is a bit of a stretch. I do believe the prices will go down over time and these are definitely far cooler than any 500-in-1 generic hobby kit, but sticker shock may drive parents away. However, the kits are very clearly a labor of love and are great fun for geeks and geeks-to-be. The Extended kit adds USB power and a large USB fan to the mix as well as a plethora of momentary switches. You also get a piezo buzzer and long-lead LED for creating a buzzing, highly annoying light up bug. The Starter Kit includes a pressure sensor and the aforementioned pulse bit that sends a regular pulse to the output, allowing you to create an intermittent flasher. You can also add a “bar graph” to a potentiometer in order to create a cool light readout. Again, these guys are pretty expensive but they’re pretty cool. If your wee ones are into electronics they’ll love being able to mess with these kits and they are equally interesting as creative office toys. It’s a fun way to become acquainted with electronics from one of the most popular hardware startups in New York.